EAGLE COUNTY, Colorado – You could soar into the air, catching panoramic views of the surrounding mountains before being sprung back down and then up again. Or you could try a four-wheel adventure tour that can take you higher than many people can go on a hike or skiing. Summer activities at Vail and Beaver Creek mountains are endless – there are perhaps more recreational opportunities in the summertime than the wintertime, and there’s certainly more variety. Here is a brief look at some of the activities available at both mountain resorts. For more information, visit http://www.vail.com or http://www.beavercreek.com. Vail Mountain has come a long way from its roots as a wintertime destination. The resort continues to add onto its mix of summer offerings, especially through its Adventure Ridge activity center at Eagle’s Nest. Adventure Ridge is a family-friendly center offering things such as horseback tours, pony rides, lawn sports such as Bocce ball and horseshoes, a rebound trampoline, climbing wall and open-air vehicle tours. Walking Mountains, formerly the Gore Range Natural Science School, also offers guided nature hikes at 11 a.m. and 2 p.m. daily that leave from the Nature Discovery Center at the top of Vail Mountain. Adventure Ridge’s trampoline is one of the most popular activities for children on the mountain, and every now and then a daring parent will test it out, too. 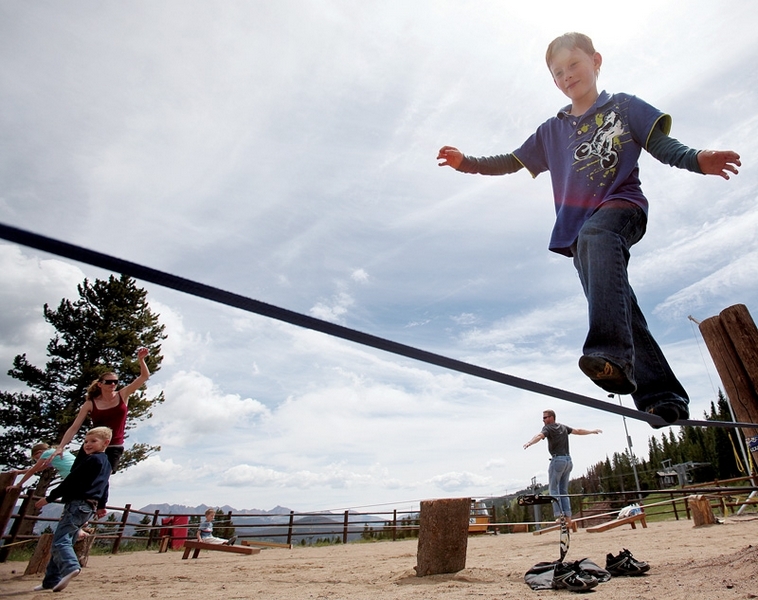 Adventure Ridge added a slackline park this year, which is a free activity where people of any age can test their balancing skills on 2-inch-wide elastic ropes about 2 feet off the ground. Gentry said the park has added a lot of good energy to the top of the mountain as parents hold their children’s hands as they try to walk the ropes. Horseback tours at Vail are beginner-friendly, Gentry said, so anyone older than the age of 7 can try a ride regardless of ability levels. Pony rides are offered in a small area for children ages 2 to 6. Disc golf is back this year with an 18-hole modified course, also good for any ability level, Gentry said. Adventure Ridge rents discs for those who want to try the sport. Hikers can choose guided tours or simply ask Adventure Ridge employees for hiking suggestions. Friday Afternoon Club, happening every Friday through Sept. 3, features live music at the top of the mountain with food and drink specials. Having trouble with the altitude? A simple ride up and down the gondola is scenic and fun for those who might not be able to try some of the more adventurous activities. For mountain bikers, there are plenty of shops in Vail Village and Lionshead that rent bikes, such as Vail Bike Tech, Charter Sports, Bike Valet, Vail Sports, Double Diamond Ski Shop and Performance Sports. Some shops also offer cruiser bikes for those who just want to ride around town. Think winter is over in Beaver Creek? Think again. Outdoor ice skating in Beaver Creek Village happens year-round, except this time of year you can leave the mittens and jackets at home. From ice-skating to miniature golf to a rebound trampoline and a climbing wall, Beaver Creek is a happening place this time of year for adventure seekers. Unlike Vail, most of the summer activities are at the base of the mountain, but there’s also some fun to be had at the top. The resort is offering new high mountain adventure tours in a four-by-four customized vehicle. Beaver Creek spokeswoman Jen Brown said the guides on the trips talk about the area’s history and point out fun facts along the way. One- and two-hour tours are offered. “It’s a completely different way for summer guests to explore the mountain,” Brown said. Beaver Creek also offers horseback and pony rides, and families can check out the children’s museum or the water fountain on the north end of the plaza. Disc golf is another popular activity, especially among the locals, at Spruce Saddle. Beaver Creek also has a couple of unique offerings like the Culinary Demonstration Series on Friday and Saturday evenings. Local chefs provide free cooking demonstrations paired with wines in the Bon Appetit tent in the village. And rather than a so-called Friday Afternoon Club, Beaver Creek has Fridays at the Park at the Park Hyatt. It’s a family event featuring live music, volleyball, kids’ crafts and free s’mores. For parents looking to have some quiet time for the day, Beaver Creek also offers a day camp for children ages 5 to 13. Camp activities include things like go-cart rides, mountain biking, canoeing, crafts, hikes, swimming and horseback rides. Beaver Creek in the summertime is all about variety, Brown said. “And it’s all about being outdoors,” she said.